Kia didn’t have a lot of success in the subcompact segment. At the end of 80’s and all the way through 90’s it only managed to offer rebadged version of Ford Festiva. Despite the fact that Festiva moved to new generations, Pride managed to stay basically unchanged 1986’s car all the way to the new millennium. Then in 2000 came Rio, Kia’s own model, which did appear as magical compared to mentioned Pride, but not that great when compared to anything else. It was cheap and reliable and there was nothing else to brag about. The second generation came in 2005 sticking to the previous recipe. But then in 2011 when the third generation debuted Koreans turned its own world upside down. 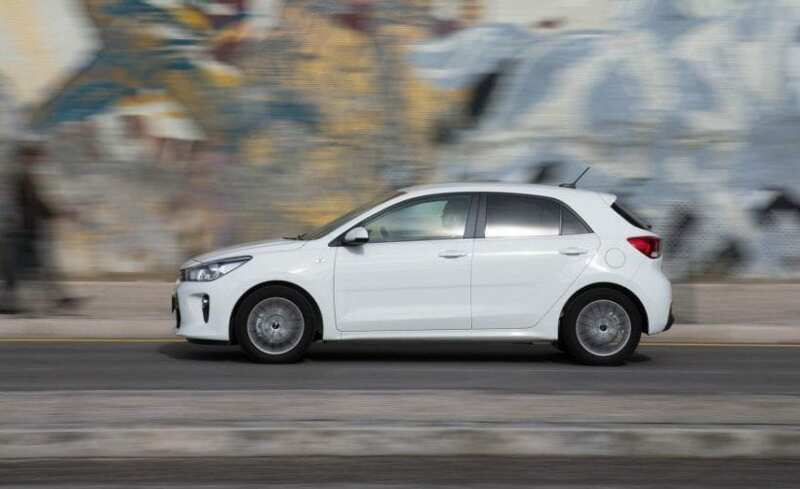 Attractive and fancy looking on the outside, assembled from quality plastic with rich and refined design on the inside, Kia’s supermini becomes an alluring thing for the first time. Now a new generation is here as 2018 Kia Rio and it has quite a reputation to defend now. Styling-wise, we can say that same thing was done as with new Hyundai i30. It is sort of a less looker now, at first glance, we could even say less attractive, but on second glance you’ll see that it is more refined and mature. The front is more serious, everything is sharpened up, and it looks more sporty with a much bigger air intake. Tiger nose grille is now blacked out plastic piece between chrome border lines. We don’t have anymore violently rising waste line and funky positioned mirrors sitting on doors, while the rear end is more angular and again more mature. It appears that beautiful, young, rebellious teenager grow up to be a smartly dressed accountant, and both have their separate audience. Same as for the exterior, the cabin doesn’t try to attract you instantly with design as before, but it wins you over by the time with ergonomics, refinement, and attention to details. We would say old German recipe. The 7-inch touch screen is quite lavish in colors, and it works without any glitches, while it can support Apple CarPlay and Android Auto. The car can accommodate four in comfort, when fifth enters, you can delete comfort part of the sentence, but still, it does offer a decent amount of room. You can also opt for some neat features to make you feel special, as lane departure warning, automated emergency braking, heated steering wheel and similar. As for the engines, you can choose between 1.2-liter naturally aspirated I4 delivering 83 hp, which carried over from the previous generation unchanged, or 1.0-liter turbocharged I3 with 99 hp, which is a new thing. If you are into diesel stuff, you have 1.4-liter I4 boosting 89 hp that also comes unchanged from the older model. All engines come with manual transmission, while you can opt for 4-speed automatic, but you shouldn’t as a plain number of speeds give you answer why. New Rio hasn’t debuted in the US yet, and when it does, things under the hood will be much more interesting. Current 1.6-liter naturally aspirated I4 will follow up and currently, it makes 138 hp, which is quite above any of the European offerings. Also in the US, this unit will be mated to a 6-speed automatic, which is again definitely more serious thing than the stuff on the old continent. This was week spot of the predecessor, with just average handling and more than average presence of understeer. Despite larger dimensions new Rio is lighter, mostly due to increased use of high-strength steel and the whole car is evidently stiffer. One more good thing is the fact that steering wheel is not numb anymore and overall driver enjoyment feeling reached another level. 2018 Kia Rio SHOULD YOU? 2018 Kia Rio maybe lost some visual appeal on the first impression, but the cabin is actually more refined, and it is finally fun to drive. If you are for funkiness in the segment, you can turn your attention to Citroen C3 or new Nissan Micra, but if you want to appear mature and serious, VW Polo got a fierce competitor in Europe, and it’s yours for around €11k ($12k) there.